I love Thailand and over the years have travelled to 'The Land of Smiles' on countless occasions. There is, however, one hotel that stands out from the rest - The Sarojin, Khao Lak (one hour north of Phuket International Airport). Having just returned from my fourth stay in as many years, perhaps against my better judgement, I am going to share with you this secluded tropical paradise. The Sarojin has a gloriously romantic setting surrounded by white sand beaches and is only an hour from the Similan Islands, one of the world's top ten dive sites. The hotel's main focus is on personalised, impeccable service, employing an impressive 245 staff for 56 rooms! Luxurious guest rooms are scattered secretly throughout the beautifully manicured gardens. There are three choices of accommodation on offer; The Spa Suite, The Pool Residence and The Garden Residence, all of which have everything you could want for a supremely comfortable stay, including private gardens, sundecks, couples bath and rainfall showers. Pool Residences have a private pool and the luxurious Spa Suites offer a relaxation pool and complimentary Spa credits for each day of your stay. Residences images courtesy of The Sarojin. The Sarojin has four dining locations on offer within the resort: Ficus Restaurant (contemporary Mediterranean cuisine), Wine Bar & Cellar at Ficus (award winning wine list and tapas), Edge Beach Restaurant (Thai and Seafood) and The Beach Bar (Happy Hour, cocktails and wine). Breakfast (served from 06:00 to 17:00... no queuing here!) is served at Ficus Restaurant. Sitting overlooking the tranquil pond is absolute peace & tranquillity. Start with a complimentary glass of bubbles and freshly baked pastry's from the basket. Then order from the vast à la carte menu which will provide even the fussiest of eaters something delicious. Begin the evening at the stylish Beach Bar with views across the Andaman Sea and then settle into Edge Restaurant which serves up traditional Thai dishes (the best I've ever eaten) with a focus on quality ingredients. The team of personal guides delight in tailor-making bespoke experiences including private jungle adventures or snorkelling/diving trips on The Lady Sarojin. The list of activities is endless. 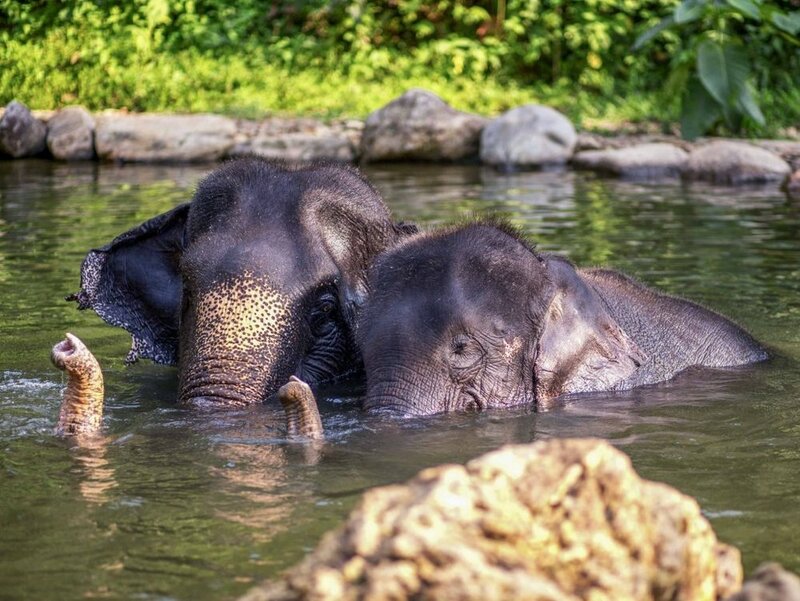 Choose from Thai cooking classes, becoming an Elephant Owner For A Day (a must do! ), white water rafting & trekking, rock climbing... the list goes on. The Sarojin also offer extraordinary, romantic dining experiences by a candlelit jungle waterfall or a secluded white sand beach on your own private island. Not to be missed! Finally, be sure to spend at least one day at the award winning Pathways Spa during your stay. The treatments are truly second to none. Then, in your downtime, relax by the turquoise-tiled infinity pool, which is fringed by palm trees and private cabanas. The Sarojin established a community fund in 2004 and has contributed to a number of projects including The Camillian Social Centre (registered as 'Sharing For Life' on Facebook) for underprivileged, disabled children. The hotel provides guests complimentary return transfers to visit community projects supported by the fund. P.S. - Children over 10 years of age are welcome at the resort. 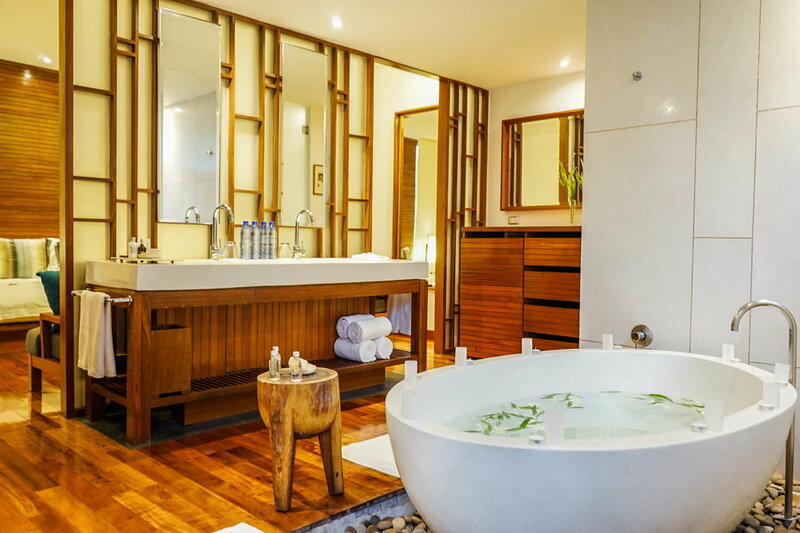 All images courtesy of The Sarojin.